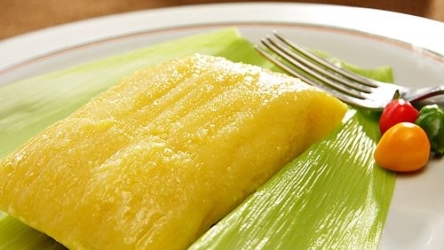 Brazilian Pamonha is a corn paste wrapped in corn husks. 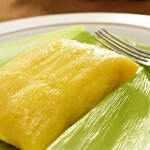 Husk the corn carefully to preserve the leaves and make small envelopes with them that you can close and tie shut. Grate the corn in a large bowl then add the salt and oil. Fill the envelopes with this paste and put a slice of cheese on top. Tie shut and place in a large pan. Completely cover with boiling water and simmer on medium heat for about 1 hour.